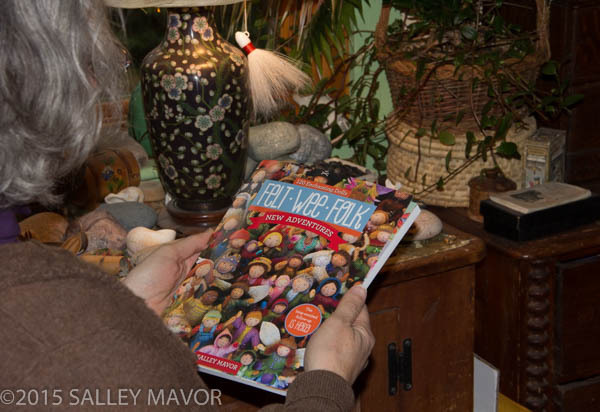 I am pleased to announce the release of my newest how-to book, Felt Wee Folk – New Adventures: 120 Enchanting Dolls by Salley Mavor, C&T Publishing ©2015, 160 pages, 8″ x 10″. It’s available from booksellers, but books ordered from my Etsy Shop (here) include some extra goodies; autograph, pack of Felt Wee Folk Playing Cards (also sold separately here) and faux flower skirts and wings to make 2 fairies. 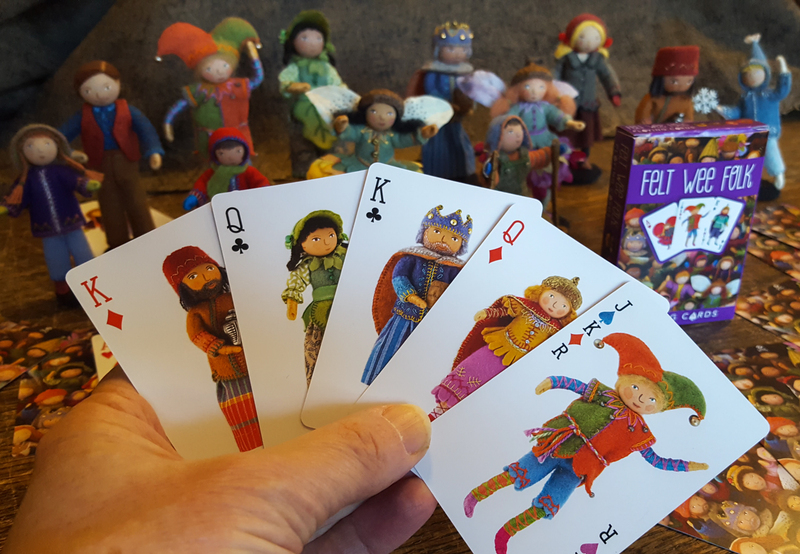 This long-awaited all-doll version expands the wee world introduced in the original edition of Felt Wee Folk: Enchanting Projects (C&T Publishing 2003), with pictures, directions and patterns for making more bendable figures with a variety of hairstyles, outfits, and armatures. Favorite doll projects from the first book, including acorn-capped blossom fairies and other fanciful wee folk make a return appearance. And as requested by fans, more challenging techniques, such as wig making are added, making this book suitable for all skill levels, from the beginner who is learning the blanket stitch to the experienced embroiderer who relishes fine stitching. The book is bursting with inspirational photographs of little characters (sized 1.5″ – 4.5″) set up in miniature worlds, from woodland scenes to doll houses, to fairy gardens. A certain type of person enjoys creating and looking into tiny, enchanting worlds and this book is for them! These dolls appeal to the child within you, no matter your age. Take a behind the scenes look at photo shoots for the book here. Supplies to make the wee folk dolls, including wool felt can be ordered from A Child’s Dream. They also offer a Felt Wee Folk craft supply basket with practically everything you need. And I sell faux flowers to make fairies and wool fleece fairy hair, as well as the book in my Etsy Shop. 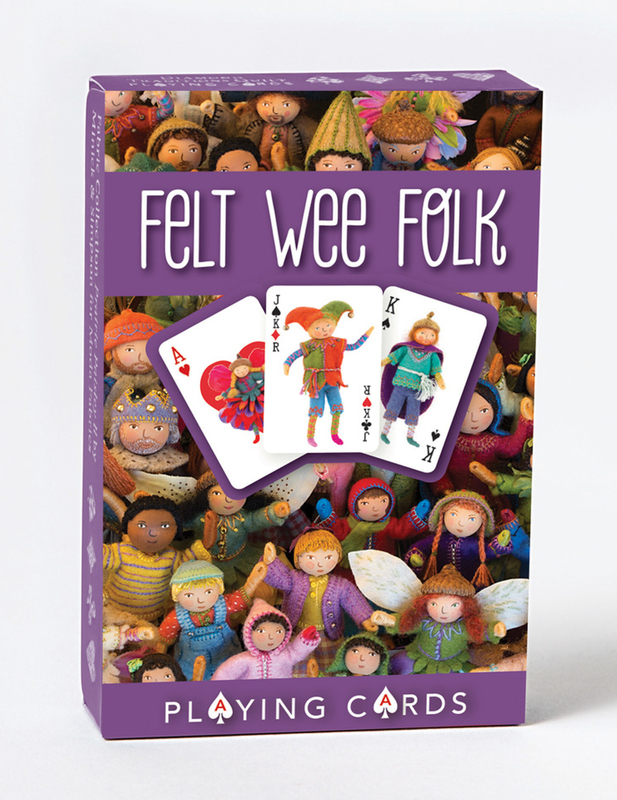 Felt Wee Folk Playing Cards have recently been added to C&T Publishing’s product line. They are available in my Etsy Shop here. sandwich library in windsor, ontario? Please put in a request for the book! How very talented you are!! These are beautiful . 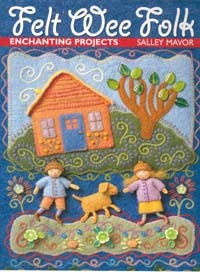 Sally I really enjoy making your fairies out of your book, Enchanting Projects. I am wondering what size seed beads to use on the 3 /12 inch – 4 inch dolls — 11/0, 8/0, or 6/0? I am anxiously awaiting my autographed copy of New Adventures. You are an amazingly talented woman Sally — I hope one day to come close to you with my own designs. Thank you for sharing!! Thanks, Annette, I’m glad that you’re enjoying making fairies and your new book should arrive soon. The larger dolls have 20mm wooden bead heads. I just realized that you asked about seed beads, not wooden ones. They are 8/0 or smaller. Salley your work is magnificent! It takes me to another world! Much success!!! Hi Linda, I look forward to meeting you and seeing what you’ve made next week at the museum! Are these dolls small enough to use in the traditional dolls house? Yes, the dolls are 1 1/2″ to 4″ and will fit a traditional doll house. Dear Salley, I have had one of your kits for YEARS in my collection of “Someday I’ll get to that” items. It’s the Nut Cap Children (c2001). I finally got it out this morning and wondered if the Wee Folk Studio was still around. I’ve been poring over your website, the work on the little house in North Africa, the dollhouse people… everything is so lovely and amazing. Thank you for the work you do. It’s very, very inspiring. I can only hope to have half the patience you do. I’ve started a shop on Etsy but it’s slow going! Hope springs eternal :-). Ce serait merveilleux si le livre était offert en français, mais c’est une décision de l’éditeur. I love what ur doing. The are awesome mAdam. Unimaginable talent. Hats of to u.